The life of a Japanese language learner can be an expensive one. With all the manga and novels one has to import in order to keep a rigorous reading schedule, it can be a burden on the budget. But just as there is an abundance of free papers in Japan, there’s a whole world of free material on the internet just waiting to be read. 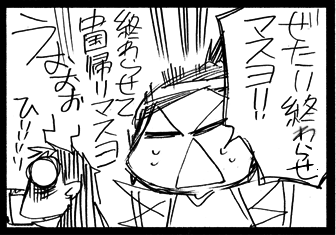 In particular, I want to introduce 4コマ (four column manga) and 立ち読み (reading samples). 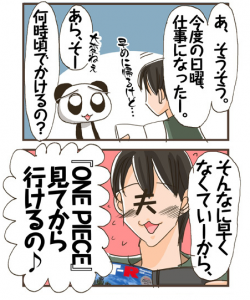 4コマ are short manga consisting of four panels, often comical, that can be found both in print and online. 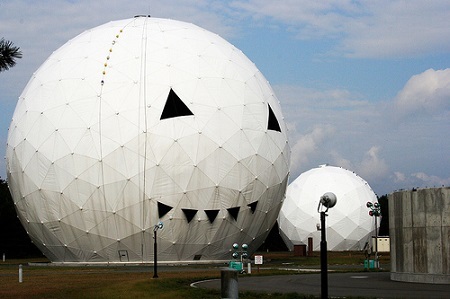 There is a wide selection of 4コマ to be found throughout the internet. They are a great way to squeeze some Japanese into the little moments of one’s day where your time is limited. Most of these 4コマ have no furigana, providing the opportunity to use them to study kanji. Don’t let this intimidate you. Since ４コマ hardly ever have a plot to follow, the kanji is rarely a barrier to enjoying the comic during those times you can only fit in reading without actively studying the material. The art style of 4コマ can really range from messy to neat, as shown in the example above to the left from 中国嫁日記 and to the right from まるちゃんねる. 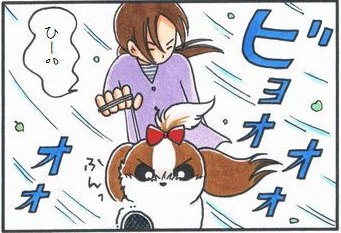 The typical 4コマ is written about the artist’s life or is a parody of an anime, manga, or video game series. Some series come up with clever nicknames and caricatures to mask the identity of the close ones they are writing about, even themselves. 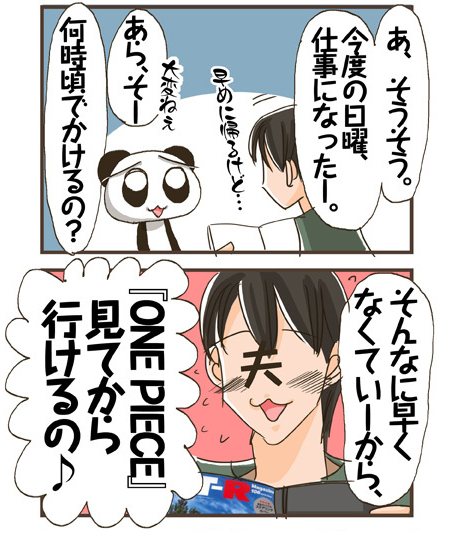 Note in the example to the left from パンダのブログ the artist’s identity is masked by a panda caricature and her husband’s by a faceless man who’s referred to as 夫 (literally, “husband”). 立ち読み is a phrase that comes from the act of standing and reading at a bookstore. Since most books in Japan are unsealed, there will be dozens of people in a store just reading. In cases where manga is sealed, sometimes there will be a sample booklet beside it, with the first chapter of a volume from the manga to preview it before one buys. These one chapter samples can also be found online for various series. Companies such as 花ゆめコミック have a site dedicated to these samples. Other manga series have sites of their own, such as よつばと！ and Love So Life. When you run out of new reading material, a good way to browse for new series is to type in the name of a series or company with the word 立ち読み next to it into a search engine. For those of you who are already reading 4コマ, what are some of your favorites? Mine is 毎日がママレッスン, a ４コマ that follows the story of the artist from her pregnancy onto raising her child, りーちゃん. Writer and Educator. Learning Japanese using immersion, currently soaking up as many novels and manga as possible in hopes of one day writing her own novel in Japanese. Also because she loves Japanese books. Are you Getting Enough Language Boosting Sleep? It’s 立ち読み not 読み立ち. Although if you google for what you want to read with 読み立ち then it’ll probably still come up with results.. There are a lot of blogs which use manga to illustrate stuff as well, I like ハラショーな日々 (isn’t really updated anymore but you can go back and read the earlier ones, it’s written from the perspective of a Japanese woman who is married to a Russian guy, and it’s generally about the daft things that he does), and ７人家族の真ん中で (about a woman who lives with her 3 children, husband, mother in law and her… aunt in law? Is that a thing?) . Both of these are true, and the entries can range from really easy to understand to slightly challenging, so maybe they’re okay for everyone. えー！　Thanks for pointing that out. I must have switched it in my mind at some point, because checking my own blog, I used to know that last year when I found out about it. And actually, 読み立ち (the incorrect phrase) doesn’t even bring up the right results. After all, you have to stand before you can read. It makes sense. I think Japanese words are weirdly easy to say back to front.. it’s probably my most common mistake when I’m speaking (and writing but normally I have time to notice and correct myself). The strange thing is that I recognise the correct word, so it’s not like I’ve remembered it incorrectly or anything. Hmmm! Luckily people seem to understand me anyway most of the time, and normally I get told that those kind of mistakes are かわいい so it’s okay! as always, a great post! and the link to 花ゆめコミック comes really handy for me. Thanks! These comic shorts are a great idea, thanks! I’ve been enjoying reading the パンダのブログ since not only do you get a comic, but you get additional commentary from the artist AND comments from fans. Definitely a great resource. I’m so glad some people have found the resources I listed helpful (^_^). Happy reading! Assuming everyone knows about it, but if not; It’s about WWI and all the countries are represented as single people. It’s mostly comedy with some history in there as well.